■ What are the opening hours? ■ How do I get to the museum? ■ Are there any parking lots? There is no public parking facility at ARCHI-DEPOT. If you do drive, there are commercial parking lots located throughout the area. ■ How much is an admission ticket? *Transition to reservation system starting on March 27th, 2019. Buy online tickets here. ■ Are there any group discounts? ■ Are there discounts for senior citizens on tickets? We do not offer senior citizen discounts. ■ Are there discounts for people with disabilities? With a certification of disability, admission is free as well as that of an accompanying caregiver. ■ Are there discounts for students? The admission for students currently enrolled full-time at a university or an educational institution is 2000 yen. under 18 is 1000 yen. Please show a valid ID or documentation at our reception area. ■ Is there a membership program? We are undergoing plans to establish a membership for those who would like to support our activities and contribute to the preservation of Japanese architecture. ■ Are there coin lockers at the facility? There are coin-operated lockers (100-yen refundable deposit) that the visitors can use at our facility. Our staff will keep big suitcases in the reception area. ■ Are babies and toddlers allowed? Babies and toddlers are allowed access to our museum. However, if they become a source of disturbance to the other visitors, our staff may approach the visitor to bring them outside momentarily. ■ Are strollers allowed inside the museum? Strollers are allowed within our facility but not in our exhibition area due to our narrow corridors. Our staff will keep them in the reception area while they enjoy the exhibition. ■ Do you have wheelchair access? The exhibition area is accessible by a wheelchair. ■ Are there wheelchairs at ARCHI-DEPOT? Unfortunately, rental wheelchairs are not available at our facility. 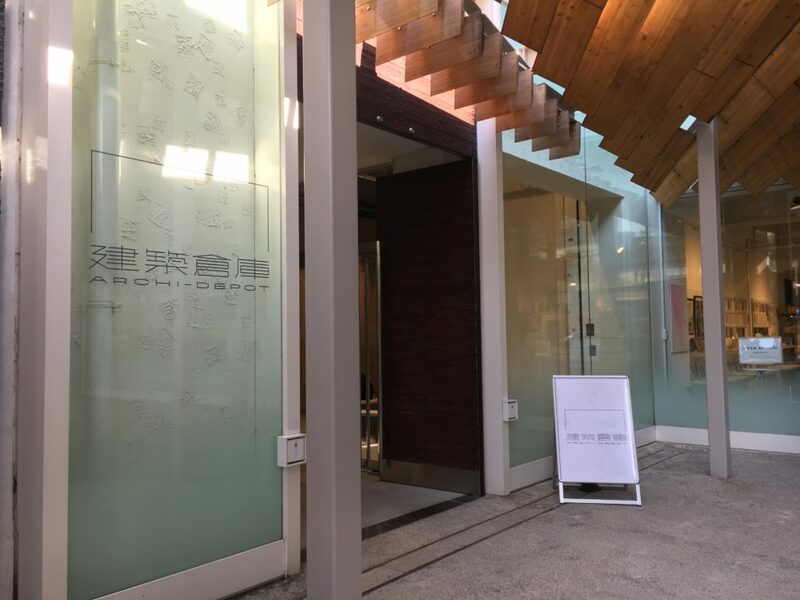 ■ When did ARCHI-DEPOT open and what is its purpose? ARCHI-DEPOT opened on June 18th 2016. Click ABOUT for details. ■ Who designed the ARCHI-DEPOT logo? The ARCHI-DEPOT logo is designed by Kenya Hara of Nippon Design Centre. Click ABOUT for details. ■ Are there any other facilities around the museum building? There are cafes and restaurants; e.g., SOHOLM, breadworks, and T.Y. HARBOR on the Bond Street, which stretches over 200 meters, connecting Fureai bridge and Kaigan Street. PIGMENT, a store nearby, designed by the world-renowned architect Kengo Kuma, specializes in the rare painting utensils of Japan. The organic curves deriving from the image of bamboo shades feature the facility’s modern interior and exterior designs. ■ How long does it take to view the exhibition? On average, our visitors take about an hour to go through the entire exhibition. ■ What are the architectural models in display right now at the museum? The exhibited materials tend to change based on the firms’ needs because the architects are temporarily renting our shelves to exhibit/keep their architecture models. Although we cannot provide an answer to how long certain models will go on display, we will continue to post our newest information via SNS. ■ Are there bilingual captions for the exhibition? Yes, there are bilingual captions available in the exhibition. ■ Are there audio guides to this exhibition? We do not have an audio guide for the exhibition at the moment. ■ Are there any plans to hold special exhibitions, lectures, or other events in the future? We have plans to hold events on a monthly basis. Click EVENTS for information on future events. ■ What time of the day is ARCHI-DEPOT the least crowded? In general, we usually see fewer visitors after 4:00 p.m. on the weekdays. ■ Is drawing and taking photographs allowed? ■ Is it cold inside the museum? We try to maintain the optimal temperature and relative humidity for the preservation of our architectural models. Because the temperature within our museum might feel cold compared to the weather outside, we recommend bringing an extra piece of clothing to keep warm while visiting us. ■If you have any further questions, please feel free to CONTACT us.